MADISON, Wis., Oct, 19, 2017 /PRNewswire-USNewswire/ -- Wisconsin cheesemakers sent 30,000 pounds of Wisconsin Cheese to Florida for those affected by Hurricane Irma. The statewide effort was coordinated by Wisconsin cheesemakers, Wisconsin Milk Marketing Board (WMMB), Independent Procurement Alliance Program (IPAP) and Wisconsin dairy farmers. 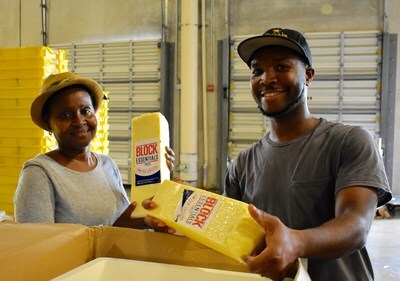 Good News, a partner agency of Feeding South Florida, are selecting calcium-rich cheese to distribute to food insecure families in Miami-Dade County. Scott Eithun, President of IPAP with Wisconsin Cheese donation to Irma victims.